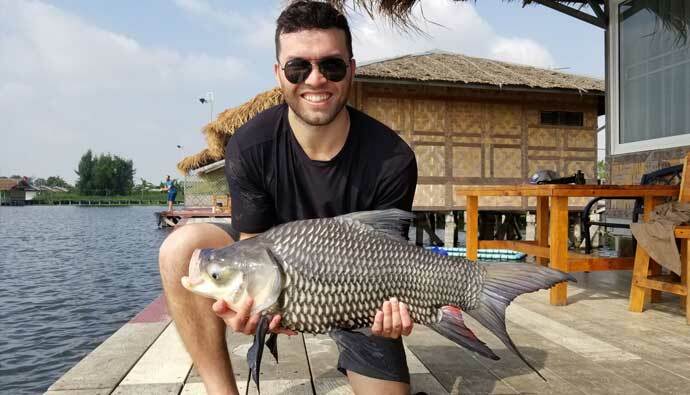 Fishing in Bangkok means fishing for river monsters! I’m sure you’ve seen the River Monsters Arapaima episode with Jeremy Wade where he pulls out what looks like a dinosaur from the water. Wouldn’t you like to catch one yourself? Here’s the biggest Mekong Catfish I caught at Bungsamram. Or how about a Giant Mekong Catfish? Those can reach north of 400 pounds in the wild and take forever to reel in. I’m currently in the airport trying to wrap my head around the awesome fishing I experienced in Bangkok over the past few days. Never in my wildest dreams when I started Cast & Spear would I think it’d be fortunate enough to knock off some monsters off my fishing life list. Now I want to share with you how you can do it as well. 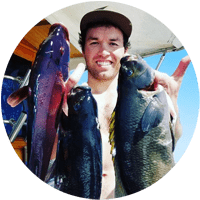 Let’s dive into how you can get started fishing in Bangkok an experience your own version of River Monsters Thailand. 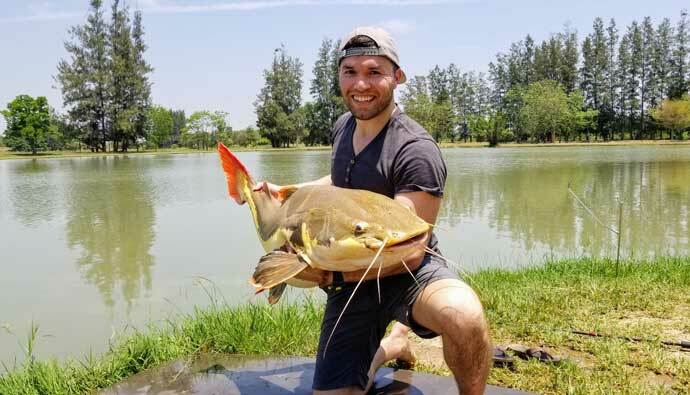 Fishing in Thailand seems more exotic from the images online than when you start fishing there. Not that I’m complaining, I’m just stating that my biases and expectations were a bit different the first day I started fishing. Definition of vacation fishing: The near guarantee to catch lots of exotic fish while having some comforts of home like beer and air conditioning (at Bansamram). Let’s dive into the different popular lakes around Bangkok, then I’ll share some stories of my two days fishing with Tap from BKK Fishing Guide. Thailand is special with the number of stocked lakes that are loaded with exotic species of fish that are hard to catch in the wild. At least for the everyday angler. 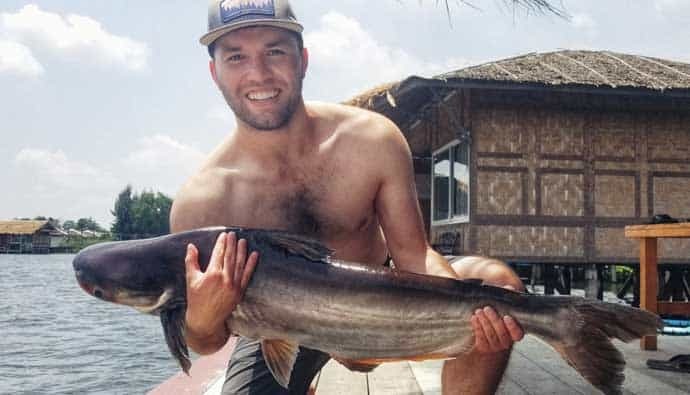 We’ll get into the ecological and moral considerations later in this article, but for now, I want to share with you want you can look forward to if you decide to go fishing in Bangkok. 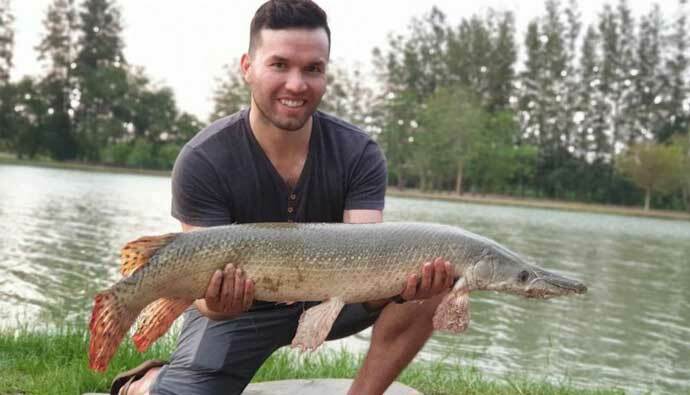 If you want to feel like Jeremy Wade and land your own River Monsters Arapaima, then this is the lake you need to visit. The method of choice to catch one is with a lure. Best of all there isn’t just one or two in the lake that you’re going after, there are many. It’s not a guarantee to catch one, but your odds are high. My hefty Asian redtail catfish from IT Monsters Lake. 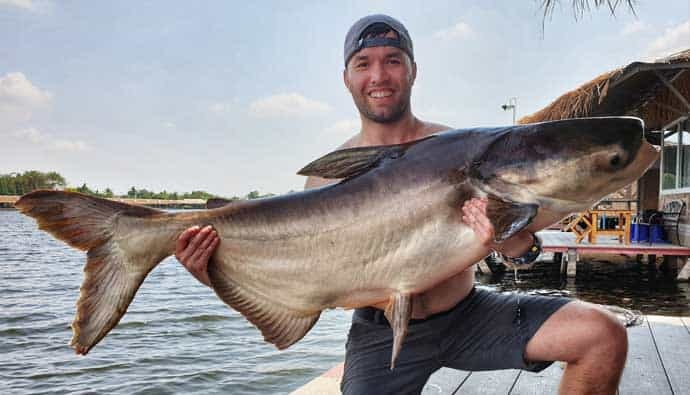 If you can’t land one on the day you visit, you’re still bound to catch Redtail Catfish, Alligator Gar, Chaopraya Catfish, and many other species. Bungsamran is every angler’s dream vacation spot. Imagine a lake that’s full of thousands of fish and many different types of species. Siamese Carp are some of the coolest looking fish! If you splurge a little you can get your own bungalow and guide who takes care of all the bait and casting activities and all you have to worry about is setting the hook and landing the fish. You’re probably saying…but that’s not fishing, that’s lazy. And you’re right. But I guarantee it’ll be fun bringing in those 200lb catfish to your private dock. Heck, you’ll even catch some giant carp fish sure to blow your mind! Bungsamrun could be considered the best fishing resort in the world. It’s Vacation Fishing, the art of enjoying the activity while having some beers, good Thai food, and hanging with your family and friends. Think of it as the Disney Resort for anglers. There’s even a full-service kitchen to bring you whatever you need. The bungalows have an air-conditioned room for you or your family to escape the heat for a bit and a shower to rinse off all the fish slime you’ve accumulated from holding your prized catches. With a ball of bread on your hook, you’re nearly guaranteed a Giant Mekong Catfish within minutes or a Siamese Carp. Both are stunning creatures and fun to bring in. Pack a metal spiral baitholder with bread and tuck in the hook. The fish will vacuum the bread up when they eat it and if you set the hook properly, you’re in for a fight. On my first day of fishing in Bangkok, Tap over at BKK Fishing Guide took me here. I was greeted with my guide Wei who took care of the heavy lifting of loading my bait and telling me where I should fish for the best luck. While he waited with the bait rods, I was busy using various lures to no avail. It was hot, and the fish weren’t biting much. Striped Catfish caught at Bungsamran. Wei told me it was the hardest day of fishing on that lake he’s ever seen, but we still managed to catch plenty of Red Tail Catfish and even an Alligator Gar. I fought a Chaopraya Catfish early in the day, but when it got close to shore, it showed it’s head and came off the hook. I was devastated. The funny part is that the bait used was a banana…who would have thought! I caught some amazing Redtail Catfish and it felt like my personal Redtail Catfish Pond for the day. They are awesome fish! Another stocked lake that you can venture to and try for over 40 species. If you go with Tap over at BKK Fishing Guide, then you’ll be fitted with a few different setups for carp and predator fish. Two fish that are notable here is the Great White Sheatfish and the Pirarara (Amazon Redtail Catfish). There is another lake similar to this one called Pilot 11 if you end up running through all the other bodies of water listed above. There are two species sure to get every fly fisher excited, the Peacock Bass and the Barramundi. Tap took one of my buddy’s to a private Barramundi pond on the day I wasn’t fishing and he caught two. There’s no shade at the pond and it was the hot season, but Garry pushed through it and checked that fish off his bucket list. I won’t lie, I was scared to hold this alligator gar. 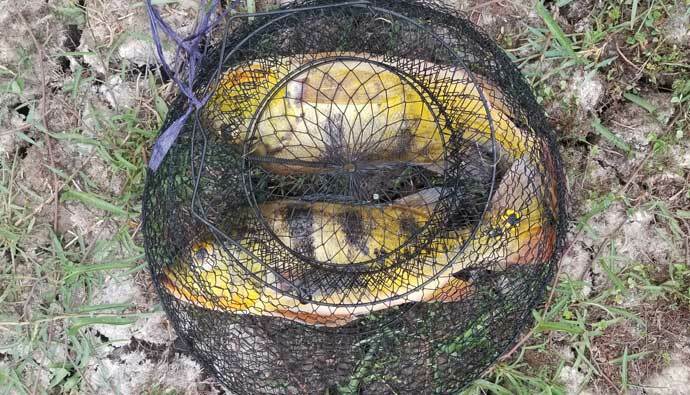 After we fished Bungsamran, Tap got word that the Peacock Bass were biting at another lake. Garry didn’t land one of those, but he did get a few bites in a short amount of time. If you’re interested in flyfishing Thailand, there’s plenty of it to enjoy! There are many Thai fish species for you to go after. Many are found primarily in the Amazon, but if you don’t want to risk the diseases or the hefty cost, making a quick trip to Thailand to get a shot at them is worth it. Tap is the man. He’s been guiding people from all over the world for over six years and knows what he’s doing. He’s probably not the cheapest guide out there, but if you want guaranteed to be put on fish, he’s your man. It turns out he lived in California for a while and went to college in the midwest. His English is better than mine :). I had him as my guide for Bungsamran and Wei for the IT Lake Monsters day. Whether you have him or one of his team members as a guide, they’ll get you on fish. Some of the anglers who got to the peacock bass cleaned house before we arrived. Overall, it was worth it, especially since I planned everything last minute. Tap was accommodating and considerate and made sure my Thailand fishing adventure went perfectly. I recommend that you go with a group of friends to help cut down on some costs. If you want to learn more about my experience out there, shoot me a note through the contacts page. If you reach out to Tap, be sure to tell him I sent you. Hopefully, he throws you a discount or something :P.
Keeping fish in stocked lakes for sport fishing isn’t probably the best thing for the environment or the fish’s health. However, if it does inspire people to care about the animals in the stocked lakes, hopefully, that will translate into caring for our wild waterways. The fish pulled from Bungsamran looked healthy, however, some of the Chaophraya from the IT Monsters Lake had quite a few red hook marks on the side of their mouths. This is likely from not having enough time to heal from multiple catches. The IT Monsters Lake is considerably smaller than Bungsamran, which is why the same fish get caught over and over again. It could be worth thinking about having some off-times for the pond to heal a bit during down months, but since this is a business, that’s probably not going to happen.